Editor’s note: It’s been over 2 months since the last e-News, maybe time for you to wonder what’s going on. Please enjoy the nature notes, and remember to vote on this coming Tuesday, February 19. 7 - Who’s Running in the Primary Election February 19? 8 - So Many Election Deadlines: Do You Know Them? 17 - Great Ways to Get Rid of Old Magazines! 18 - Plant a Rain Garden to Help Area Lakes and Streams. Learn How at Workshop! and happiness is what we can pursuit* and create a sense of virtue. Do you, invent new breakthroughs, have your dreams come true. Editor: I wonder if you might have meant pursue rather than pusuit in the next to last stanza? Jesse: Yeah, I was thinking pursue or pursuit because I was also thinking about the film "The Pursuit of Happiness" and I wanted to bring that comparison of how achieve your dream of living a good life (like in the movie) so that is why I chose the word pursuit. Ron had seen it walking up Danbury some time ago and I have seen it walking up by your house. Today it came down Windflower and walked around our neighbor’s yard, then went back up Windflower, walking into a few driveways and across Loretta Borman’s lawn. It is probably looking for food. I wish it had come in my backyard, as I have three bird feeders out. Look up in your trees at night—it might be roosting there. This was the note I got a few days ago from Mary Melvin, a neighbor on lower Windflower Way. Earlier, this self-same turkey was the subject of other sightings and a flurry of notes from neighbors. On December 28, Bob Hague saw her on DeVolis Parkway. Here’s his report and photo. This hen turkey has been around the DeVolis Parkway area for several months. We think she spends most of her time in the backyards between DeVolis and Crawford - but she seems to know where every bird feeder in the neighborhood is located. I've spotted her on the parkway and Whenona, and I've been told she goes to Marlborough Park as well. She apparently weathered the big snow just fine - our neighbors saw her in our front yard Christmas Eve. I call her 'Crawford' but feel fee to come up with your own name. I’ve had my own encounters in Milford Road. Back in April 2011, I spotted a turkey pecking around under my cedar trees along the back property line. As I tried to get close enough to for a picture, it hurriedly strode over to my neighbor’s yard (Windflower Way) and then spooked and flew right over Donna Sarafin’s house. I got a blurry photo of this hunky bird, more of a bullet than a bird shape, approaching the house and then another equally unsatisfying one of it, wings out, as it cleared the roof. Then on November 28, 2012, as my partner drove into our driveway, she caught sight of a turkey parading on Milford. By the time I could get outside with my camera, it was disappearing behind our neighbor’s house across the street. I got a blurry profile picture. What more proof than this could you ask that people in the Dunn’s Marsh neighborhood appreciate our wild neighbors? 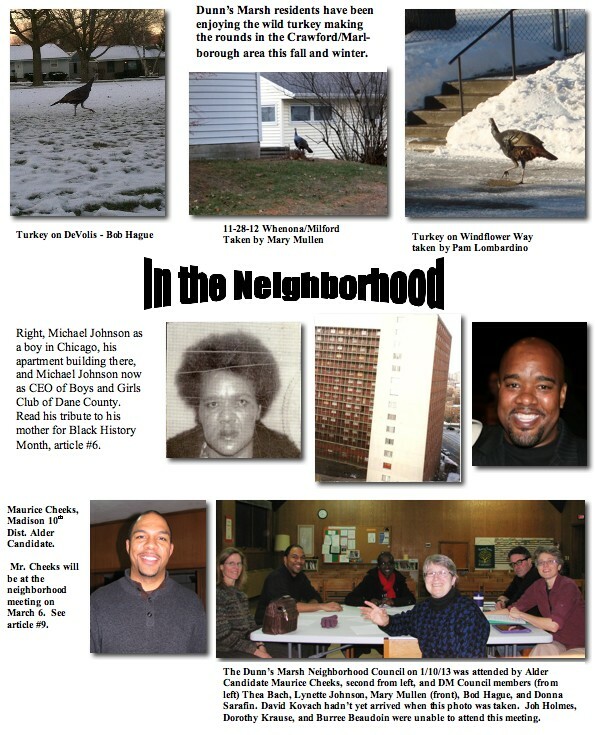 You’ve just read a poem written by our neighbor, Jesse Cole and read excerpts from other neighbors’ sightings of the neighborhood turkey. Are you also a writer of poetry or prose and willing to share your observations and thoughts with other neighbors? Send your contribution to the editor, and see yourself it print! The Meadowood Life Stories Writing Group will read from their work on Friday, February 22, at 6:00 p.m. at the Sequoya Branch Library, 4340 Tokay Blvd. The group includes one person from our neighborhood, a former neighbor, and two people who often attend Prairie UU Society in the neighborhood. The Life Stories Writing Group meets Mondays at the Meadowood Neighborhood Center to capture and preserve those pieces of memory that make up our lives. By meeting a weekly deadline to write the group creates a mechanism through which to focus and turn memory into memoir. The group has published two volumes of essays produced as part of its meetings. This is its first reading event. The public is invited. 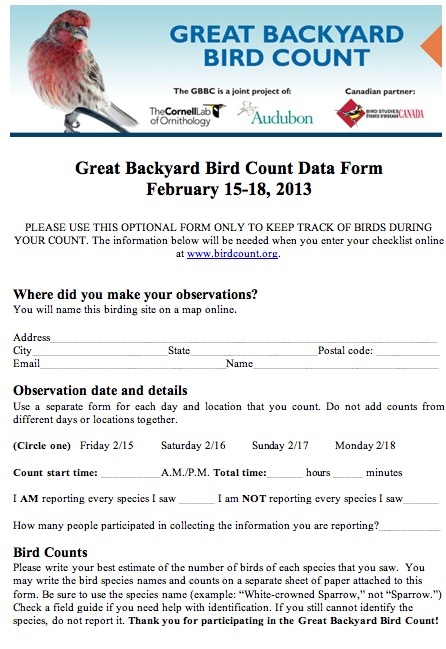 The 2013 GBBC is underway through Monday, February 18. Please join us for the 16th annual count! At least 4 Dunn’s Marsh people have particpated in the past. This year, in one 45-minute period, Saturday, February 16, I’ve seen 4 house finches, 3 cardinals, 3 chickadees, 2 English sparrows, and a junco. The Great Backyard Bird Count is an annual 4-eay event that engages bird watchers of all ages in counting birds to create a real-time snapshot of where the birds are. Everyone is welcome - from beginning bird watchers to experts. It takes as little as 15 minutes on one day, or you can count for as long as you like each day of the event. It’s free, fun, and easy - and it helps the birds. Participants tally the number of individual birds of each species they see during their count period. They enter these numbers on the GBBC website. If you’re new to this, it’s comforting to know that you only tally the birds you recognize. The idea is to participate, not prove that you are a champion birder. Beginning this year, each participant must set up a free GBBC account to submit their checklists. You’ll onlly need to do this once to participate in all future GBBC events. As the count progresses, anyone with Internet access can explore what is being reported from their own towns or from everywehre in the world. Particpants may also send in photographs of the birds they see for the GBBC photo contest. Go to http://www.birdsource.org/gbbc/whycount.html find out more about the Great Backyard Bird Count. Don’t miss the Photo Gallery where there’s a huge collectionof photos of birds submitted to the photo conest in past years. Thanking God and thinking about my mother this morning. She is one of my heroes that I honor during this Black History Month! My mother was an amazing soul! She was also my father! She was a caring and spiritual woman who taught me to treat others with respect and dignity. My mother was tough and was known around our buildings as Miss Susie and was known to give her last to help others. My mother was from Mississippi and moved to Chicago for a better life. Our apartment was small with roaches and bugs but my mother did all she could to make our place feel like a palace. We had nice furniture, we had a television, food and clothes on our backs. The only time I realized we were poor is when we walked out the doors of apartment 1605. We stayed on the top floor of our building and our apartment was always clean and felt like a penthouse with square bricks. Despite being on limited income my mother always made a way! She made me wear white business shirts to grammar school everyday and I would often have to fight others to defend myself because of my clothes. While they were not designer clothes, they were clean and nice and I did not appreciate it at the time. My mother also was not big on hugs and compassion. In fact the 1st time she shared she loved me was when I was in college and she wrote me letter concluding with the words, "I LOVE YOU and I am so proud of you." Those we're powerful words coming from my mother that I would never forget. This is why I hug my kids everyday and tell them I LOVE them and I am proud of them. RIP mom and thank you for your sacrifice!! I LOVE YOU and honor you on this Black history month day! It will be a short ballot at the polling places on February 19. The purpose of the primary is to narrow the field to 2 candidates for each office. The Spring Election will be held on April 2. Madison voters who cast their votes at the Head Start building on Red Arrow Trail will choose 1 of 3 candidates for Supreme Court and 1 of 3 candidates for School Board, District 5. Fitchburg voters in District 1 - our neighborhood - will only vote for a Supreme Court candidate because the Fitchburg part of the neighborhood is in the Verona School District where there are no primaries. If the links to the candidates don’t work, go to the League of Women Voters’ site at http://www.lwvdanecounty.org/content/voting-information-1 Under the “Learn More” menu on the right, click on Supreme Court Justice or MMSD, Seat 5 to see their answers to questions put to them by the League. February 15th - Last day (5:00 p.m.) to vote absentee and to register to vote in the clerk’s office for the Spring Primary. February 19th - ELECTION DAY - Spring Primary Election (Offices State Superintendent of Public Instruction, Justice of the Supreme Court, Court of Appeals Judge, Circuit Court Judge, County Non Partisan Offices, Municipal Offices, School District Offices, and Referenda (if required). March 13th - Last day for electors to register by mail to vote in the Spring Election. Mailed registrations must be postmarked no later than this date. After this date must register in Clerk’s Office. March 28th Last day to request absentee by mail for the Spring Election. March 29th Last day (5:00 p.m.) to vote absentee and to register to vote in the clerk’s office for the Spring Election. April 2nd - ELECTION DAY Spring Election (Offices State Superintendent of Public Instruction, Justice of the Supreme Court, Court of Appeals Judge, Circuit Court Judge, County Non Partisan Offices, Municipal Offices, School District Offices, and Referenda (if required). If you are a believer in the idea that “It’s who you know” that makes a difference in having an influence in things, March 6 is your chance to to become aequainted with two men who can work with us to make our neighborhood better. Madison 10th District Alder candidate Maurice Cheeks and the Madison Police Department’s new community liaison officer for the neighborhood Ed Marshall have been invited to speak to the neighborhood then as prelude to the regular DM Neighborhood Council meeting. All residents are welcome to attend this meeting which will begin at 7:30 pm at Prairie UU Society, 2010 Whenona Drive. The plan for the evening of March 6 is to give each of these visitors 15 minutes to make a presentation followed by 15 minutes of give and take with the residents attending the meeting. Aldermanic candidate Maurice Cheeks is running unopposed. Our present Alder, Brian Solomon cannot run for alder in our district because the newly-drawn district lines put him outside the 10th District limits. Mr. Cheeks is definitely attending the March 6 meeting. Ed Marshall is taking over for the previous liaison officer Brian Sheehy who has moved to a position in the North police district. We are awaiting confirmation from Mr. Marshall. This year Madison is joining such cities as Chicago, New York, Paris, Brisbane (Australia), Vancouver (Canada) and others to put on a global music festival on the summer solstice, June 21. 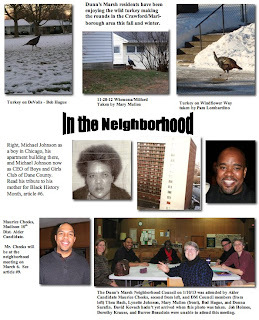 Neighborhoods have been invited to participate, and at its February meeting the DMNA Council voted to take part. What is this festival? It’s music in neighborhood venues from 4-8 pm on Friday, June 21. What’s even better is that anyone who wants to make music and/or provide a place for that music to happen can volunteer. Here’s some of the advance publicity: The festival will be inclusionary in terms of musical genres, ethnicites, styles of music, skill levels of musicians, and in the use of public and private spaces throughout our community. The city of Madison has already temporarily reserved many park shelter spaces throughout the city for this event, with the intent of making them available to neighborhood groups. Right now we are at the stage of recruiting neighborhood musicians, so if you are one - of any level whatsoever - or know someone, please contact the neighborhood association. Or if you would want to provide your driveway (or garage in case of rain) as a place for performers and listeners, please also let us know. Preferably, contact Donna Sarafin, dksarafin@yahoo.com or 273-0437. The sky is the limit. Dates have been set for the next 6 months of Neighborhood Council meetings. They are held at Prairie UU Society, 2010 Whenona Drive, Madison, WI 53711. Residents are welcome to attend these meetings. Wed., March 6, 7:30 p.m. – The new MPD community liaison officer Ed Marshall and the only candidate for Madison 10th District Alder, Maurice Cheeks, are invited to attend this meeting. If you are a Dunn’s Marsh resident, please attend and meet these officials. Wed., April 3, 7:30 p.m. Thurs., June 13, 7 p.m. Thurs., July 11, 7 p.m. Thurs., Aug. 8, 7 p.m. Sometimes you learn of interesting and accomplished neighbors when it’s too late to know them. For me this was true of Steve Smith, age 70, who passed away Dec. 28, 2012. He lived in the Belmar Hills part of our neighborhood. Part of his obituary is included here in honor of his life. Stephen Wesley Smith’s career included piano performance and teaching, at Elon College in North Carolina, 1970-73 and then at Carthage College from 1976 till his retirement in 2005. Steve was a talented and accomplished pianist whose piano training began at the age of 5. Early achievements include a solo performance at age 15 with the St. Petersburg (Fla.) Symphony orchestra. At 16 and 17 he was awarded Chautauqua Scholarships. An active recitalist, Steve presented recitals at Florida State University, the University of Michigan, Elon College, and Carthage College. He has performed as guest artist in Sarasota, Fla., Albany, Ga., and Chautauqua, N.Y., and also as guest artist with both the Racine (Wis.) and Kenosha (Wis.) Symphonies. Steve also had a lifelong commitment to social justice issues. Two of the projects to which he devoted his time, energy, and talents are the Episcopal Diocese of Milwaukee Haiti Project and the Food Pantry at Grace Episcopal Church in Madison. Steve made several work trips to Haiti to aid in distressed areas, and was instrumental in establishing a Technical College in Les Cayes, Haiti. He was a tireless worker at the Food Pantry at his church, volunteering there just a few days before his death. On February 11 Fitchburg held a meeting about changing service of some routes that serve Fitchburg including routes that serve the Dunn’s Marsh Neighborhood. Routes 19, 52, and 59 could be affected. The changes are the result of Middleton changing its part of the Bus 52 route so that it doesn’t need to share the bus with Fitchburg. Changes are anticipated to occur in August 2013. While it’s too late to go to his meeting, it probably isn’t too late to learn what was discussed and express your opinion to Fitchburg officials. These were the options that were discussed. Option 1 –Retain peak-hour service on Route 52 and extend Route 19 during off-peak periods The drawback to this option is the lack of consistent service throughout the day. If you only ride the bus during rush hours, you would see no changes to your service. But if you ride during off-peak periods, you would not have a direct connection through the West Transfer Point, though you would be able to transfer from Route 18 to Route 19 (in both directions) to complete your ride. 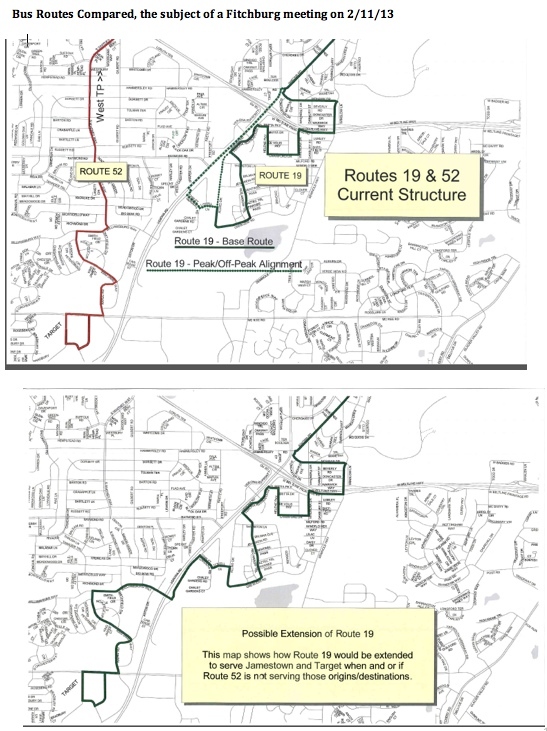 Extending Route 19 however, also creates a direct connection between Belmar Hills and Chalet Gardens to the Target Store and other area businesses on McKee Road. 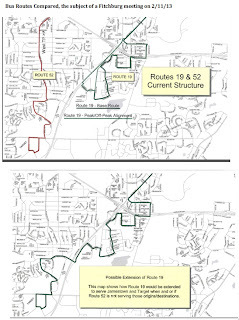 Option 2 –Eliminate all service on Route 52 and extend Route 19 to serve the area all-day This option is a service design that actually mimics service that was provided prior to 2007. The drawback to this option is losing a direct connection to the West Transfer Point. If you needed the connections that are available through the West Transfer Point, a reasonable transfer to and from Route 18 would exist (roughly a 5-7 minute wait) near the McDonalds at Red Arrow Trail and the Frontage Road near Allied Drive. Otherwise, Route 19 would provide a one-seat ride to the UW Campus and Capitol Square, SuperTarget and other businesses on McKee Road. Route 59 – Due to 2013 budget constraints, the City may look at potential service reductions to Route 59 weekend service. The City would like input on the preferred hours of operation for Route 59 service, should there be a need to reduce this service. Opinions on how Fitchburg should deal with the changes can be brought to Fitchburg alders Carol Poole carol.poole@city.fitchburg.wi.us <mailto:carol.poole@city.fitchburg.wi.us> , (h) 273-3168 or Dorothy Krause dorothy.krause@city.fitchburg.wi.us <mailto:andrew.potts@city.fitchburg.wi.us> , (h) 271-7532. Both live in our neighborhood. Have you ever wondered about how many people are riding the city buses that wend their way through the neighborhoood? Wonder no more. Here are the 2011 & 2012 statistics for buses that serve the neighborhood. For comparison, the bus system total is down 2.2% in 2012 compared to 2011, and the passenger/rev. hour statistics were 34.65 in 2011 and 35.04 in 2012. It should be notied that bus service was not provided on December 20-21, 2012 due to the blizzard. This contributed to fewer riders as compared to 2011. The UW Campus Bus 80 had the best numbers with 1,737,917 riders for a passenber/rev.hour number of 89.67. Of course this bus serves mostly students and downtown workers in a densely populated area and the service is free to registered students who can present their bus pass and student ID. Some downtown employees also get free passes paid for by their employers. Providing bus passes limits the number of parking spaces that would have to be provided otherwise and also cuts down on car traffic and pollution. Salt is one stormwater pollutant that is very difficult to manage. After we spread it on streets, parking lots, drive­ways, and sidewalks it is on its way to the nearest lake or stream when the ice melts. Fifty pounds of salt (one large bag) can pollute 10,000 gallons of water, or the equivalent of one teaspoon of salt in a five-gallon bucket of water. Municipalities are working to cut salt use while still keeping streets safe. We must all do our part and save money at the same time with these helpful tips. • Use a shovel and/or scraper first and only use deicers on ice, not snow. • Measure your sidewalk/driveway so you know how much you need. A general guideline is to use 1-3 cups of salt per 1,000 square feet. A sidewalk square is typically 25 square feet. A heaping coffee cup holds enough salt for 10 side­walk squares. • All deicers are not created equal. Each product performs best under different conditions. The most common and cheapest is sodium chloride (“rock salt”), but it doesn’t work when the pavement is colder than 15°F. Magnesium chlo­ride and calcium chloride cost more, but you’ll use less and they work in colder temps. • Consider applying liquid salt to the pavement before the storm and shovel a little while it’s snowing. You can use 30% less if you wet salt with some water before applying. 2. Dane County, MGE, and Aldo Leopold Nature Center partner in showing how to transform “Trash” to “Treasure” - It's the ultimate in recycling! Here in Dane County, garbage is transformed into energy we use in our homes. This month on Green View, MGE's renewable energy web channel, watch the story <https://www.storybridge.tv/greenview/communityaction/story/TrashToTreasure> to see how landfill gas becomes electricity. 4. Fitchburg Stormwater Volume Control Report Finalized - In 2011, the City of Fitchburg and the Capital Area Regional Planning Commission received a grant from the HUD Sustainable Communities Regional Planning Grant Program to conduct a catalytic project on stormwater volume control. The goal of the demonstration project was to determine which combination(s) of volume control Best Management Practices (BMPs) can be used to achieve no increase in runoff volume (100% pre-development stay-on) from new developments. ... The report includes a comprehensive literature review for volume control BMPs, and is available at: http://www.city.fitchburg.wi.us/departments/cityHall/planning/CatalyticProject.php <http://www.city.fitchburg.wi.us/departments/cityHall/planning/CatalyticProject.php> . Please feel free to contact me if you have any questions, comments, and/or suggestions on future Green E-News topics. Thank you! Do you have a stack of old magazines you just hate to throw into the recycling because they full of good articles and photos and they are in like-new shape? One option is to take them to the doctor’s office or dentist’s office when you go for an appointment. I’ve taken in stacks and asked if they would like them, and every time, the receptionist is overjoyed to get them. Another way is to donate your magazine to www.magazineliteracy.org <http://www.magazineliteracy.org> The website says to mail your clean, like new, intact (no torn covers or pages) to 215 Martin Luther King Jr., Blvd #405, Madison, WI 53701. Apparently this is in the Municipal Building across from the City-County building, so perhaps they could be delivered in person rather than being mailed. The website suggests getting free flat-rate boxes at the post office, filling them to the brim with your magazines, adding postage, and putting them in the mail. A rain garden workshop is scheduled for Saturday, March 2, 2012 at the Verona Public Library. Attendees can learn how rain gardens help lakes and streams, and how to plan for and install them. These simple yet effective projects help conserve water and help rain soak into the ground instead of becoming pollution-carrying stormwater on its way to our lakes and streams. The cost for the workshop is $5. The registration form is available online at www.myfairlakes.com/plantdane.aspx. The Plant Dane! Cost-Share Program, which provides rain garden plants at less than half of retail cost thanks to the Graham-Martin Foundation, will also be covered for those interested in ordering plants for their gardens and yards. The deadline for ordering plants is March 15. Plants ordered through the Plant Dane! Program will be delivered on May 18 for gardeners’ convenience. New species for 2013 include arrow leaved aster, prairie coreopsis, pale leaved sunflower, dwarf blazing star, meadow blazing star, showy goldenrod, cream wild indigo, long-beaked sedge and red bulrush. Order forms are online at www.myfairlakes.com/plantdane.aspx. Rain gardens are an attractive way to reduce lawn-maintenance time and costs, beautify your yard and help your lakes, rivers and streams all at the same time. Many find replacing turf and exotic ornamentals with plants native to Wisconsin a rewarding landscape alternative. Once established, natives do not require the maintenance inputs that turf and ornamentals need. Yet, native wildflowers provide blooms from spring through fall and provide habitat for beneficial insects and birds. Do you enjoy gardening or think you might? Then you might be interested in these internship opportunities. Community Groundworks offers a limited number of paid and volunteer positions in several different programs. The internship application can be downloaded from http://www.communitygroundworks.org/get-involved/internship-opportunities <http://www.communitygroundworks.org/get-involved/internship-opportunities> starting in January of each year. We generally conduct interviews and fill positions in March. 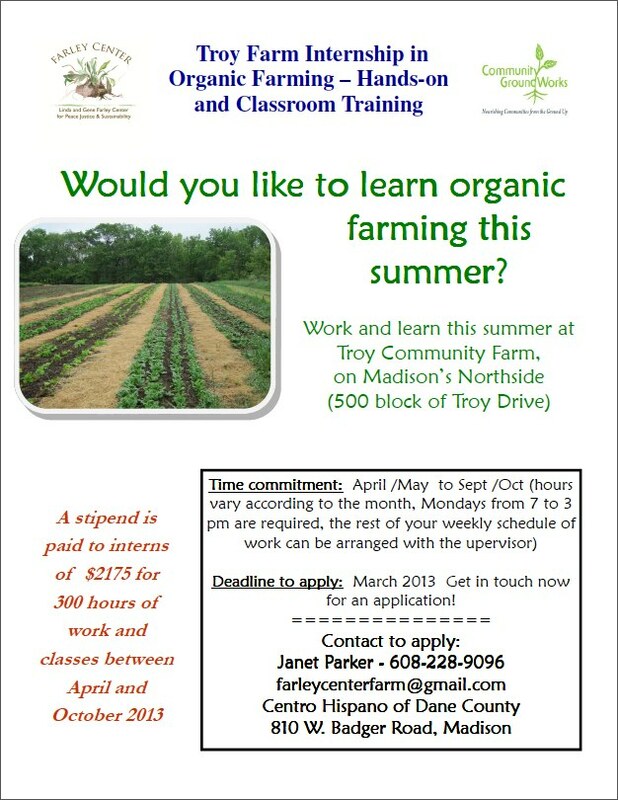 Troy Community Farm <http://www.troygardens.org/get-involved/internship-opportunities/experiences/troy-community-farm> – Work on our 5-acre farm and learn about certified organic vegetable production, our sprout business, passive solar greenhouse, CSA, and more. 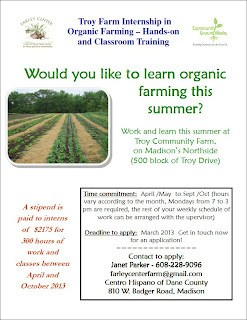 Farm internships include formal classes, weekly field tours, and field trips. Madison FarmWorks <http://www.communitygroundworks.org/sites/default/files/get-involved/2013_CGW_Intern_Application.pdf> – Learn farming and gardening skills while designing, installing, and maintaining residential gardens. This new business links the skills of the farmer with the scale of the gardener and brings vegetable gardens to our clients’ homes. Kids' Garden <http://www.troygardens.org/get-involved/internship-opportunities/experiences/kids-garden-interns> – Work with school-age children in our award-winning Kids' Garden, tallgrass prairie, edible landscape, and sugar maple woodland and gain valuable experience developing, implementing, and evaluating garden program activities for children. Youth Grow Local Farm <http://www.troygardens.org/get-involved/internship-opportunities/experiences/east-high-youth-farm> – Instruct and supervise teens on this mini-farm while learning about all aspects of organic vegetable production from raising seedlings in the East High greenhouse to harvesting and packing vegetables for the Goodman Community Center’s Food Pantry. Troy Natural Areas <http://www.troygardens.org/get-involved/internship-opportunities/experiences/troy-natural-areas> – Our restored natural areas create important habitats for native plant species and wildlife and provide educational opportunities for area youth and adults. Work with the Natural Areas Coordinator to design an internship that focuses on a specific project and/or our Natural Areas Steward program. Nonprofit Administration – Learn the essential business of keeping our nonprofit running smoothly and efficiently. Activities could include fund development, publicity, grant research and writing, and planning and implementing special events. Other positions are available through this website as well including Wisconsin School Garden Initiative Training and Outreach Specialist. This positions pays $32,136/year plus benefits. Community GroundWorks is a nonprofit organization that connects people to nature and local food. In order to modernize billing and services available to customers, the Madison Water Utility (MWU) is installing smart meter technology using radio frequency (RF) transmitters. This device, a small flat box called an Electronic Read Transmitter (ERT), is connected to the water meter by a wire, and transmits meter readings wirelessly to MWU. This installation of an Advanced Metering Infrastructure (AMI) is called ProjectH2O. The project is scheduled to begin in the Dunn’s Marsh Neighborhood on May 15, 2013. Our neighborhood is part of the last area to me radio-metered. A pilot project was completed on the north side in July 2012. Despite the many advantages of the system, MWU recognizes that some customers may want to opt-out of having the standard smart meter technology installed inside their property. MWU offers two options for the customer wishing to opt-out of the smart meter technology: have the ERT installed on the outside of the building (Option 1), or not have an ERT installed on the property at all (Option 2). The standard location for the ERT is on a basement ceiling joist directly above the water meter. A one-time, non-standard meter installation charge of $50.69 will be billed to customers who choose to have the ERT installed at a location on the outside of their residence/building. This charge of $50.69 reflects the additional average cost for customer-requested placement of ERTs on the outside of the building. subcontractor, MWU will charge actual costs for time and materials to perform an outside mount. Customers will have a quarterly manual meter reading. The monthly bill will include a charge of $7.78 to pay for the increased costs for utility personnel to perform the manual meter read and to enter information into the billing system. The monthly charge will be evaluated by the Public Service Commission with each rate increase application and could increase or decrease in the future based on actual costs. Following the completion of the installation phase of ProjectH20 and the demobilization of the installation subcontractor, MWU will charge actual costs for time and materials to remove an ERT. Please note: Many meters are due to be replaced as part of MWU’s routine meter replacement schedule. Even if you select one of the options above MSU may still need to schedule an appointment to gain access to your properrty in order to replace an old meter. MWU standard practice will be to bill on a monthly basis, so all meters will recive a monthly bill. Just wanted to remind people that no one should be afraid to call the ambulance because of being too poor to pay . . . .
An ambulance ride in Madison costs $900 for a resident and $1,000 for a non-resident plus $16 per mile. However, as the website mentions. “Generally health insurance, Medicare or Medical Assistance will pay all or part of the cost of an ambulance conveyance. For any unpaid amounts, after insurance is billed, the City of Madison does have a waiver policy based on income. For additional information regarding the ambulance fee or the waiver policy, call (608) 267-8630. You’d think you could trust Uncle Sam. But an “official” government logo is no reason not to be cautious, according to the Consumer Financial Protection Bureau (CFPB). The agency reports that scam artists are targeting struggling home owners with offers that promise government-sponsored mortgage relief. These offers might seem legit on the heels of news about the government’s $25 billion agreement with the nation’s five largest mortgage servicers to provide relief to homeowners. Tell you to stop making mortgage payments? Not making your payments could hurt your credit score and limit your options. Tell you to start making payments to someone other than your servicer or lender? Ask you to pay high fees upfront to receive services? Promise to get you a loan modification? Ask you to sign over title to your property? Ask you to sign papers you do not understand? Pressure you to sign papers immediately? If you’re suspicious, call your lender to discuss the situation. I’ve always believed that by working together we can accomplish more than any unit of government, private entity, or community can by going it alone – it’s resulted in a number of new and innovative partnerships that help address pressing needs in our community. A new collaboration I included in my budget for this year to help kids and parents succeed is beginning soon in a Madison school. Together with the United Way and the Madison Metropolitan School District, this first of its kind ‘birth to four year old kindergarten’ program will help address the achievement gap in our public schools. The pilot program will provide hands-on resources for parents to help them prepare their children for success in school with at-home education and an emphasis on enrollment in 4-year-old kindergarten. The project builds on the county’s successful Early Childhood Initiative, which has helped hundreds of moms and dads find employment, and helped their young children get a great start in life. On the environmental front, our work to clean up our lakes continues through unprecedented partnerships I’ve helped develop between farm families, the Madison Metropolitan Sewerage District, dozens of municipalities across the county, businesses, and private groups like Clean Wisconsin and the Clean Lakes Alliance. Thanks to this work, we’re making progress on lake clean up and innovating. Public/private funding will enable us to install new technology on our second Cow Power manure digester that will remove 100% of the algae causing phosphorus that makes its way into our lakes. Economic development is benefitting as well. Together, the county, state Department of Agriculture, and World Dairy Expo are working to fund major upgrades at our Alliant Energy Center, ensuring important events that contribute to our local economy remain at the facility for years to come. Together, we are getting great things done in 2013. For March 2013, the National Women's History Project selected the theme, "Women Inspiring Innovation Through Imagination: Celebrating Women in Science, Technology, Engineering, and Mathematics." It is with great pleasure that we announce the Honorees for National Women's History Month 2013. The 18 women chosen are all extraordinary visionaries and role models in the STEM fields, where women are still noticeably underrepresented. The 2013 Honorees represent a remarkable range of accomplishments and a wide diversity of specialties including medicine, robotics, computer programming, atmospheric chemistry, architecture and primatology. These women's lives and work span the centuries of American history and come from different cultural and ethnic backgrounds. We are proud to honor them and all women seeking to advance these important fields. Hattie Alexander developed the first effective remedies for Haemophilus influenzae, reducing the mortality rate from nearly 100 percent to less than 25. Alexander was also among the first scientists to identify and study antibiotic resistance, which she correctly concluded was caused by random genetic mutations in DNA. In 1964, she became the first woman elected president of the American Pediatric Society. Patricia Bath's invention of the Laserphaco Probe was an important milestone in the advent of laser cataract surgery. Bath co-founded the American Institute for the Prevention of Blindness (1976) committed to "protect, preserve, and restore the gift of sight." She broke ground for both women and African Americans in medicine and ophthalmology, including being the first African American woman doctor to receive a patent for a medical purpose. Elizabeth Blackwell was the first fully accredited female doctor in the United States. She, along with her sister, Emily, founded the first medical school for women, resulting in greater acceptance of female physicians, more opportunities for meaningful work for American women, and stricter standards for medical schools as a whole. Katharine Blodgett was the first woman awarded a Ph.D. in Physics from the University of Cambridge (1926) and the first woman research scientist for General Electric's Schenectady, New York laboratory (1920). Blodgett received eight US patents, most famously for inventing low-reflectance "invisible" glass. Her other inventions included a color gauge and glass ruler, poison gas adsorbents, and methods for deicing aircraft wings. Edith Clarke was the first woman to earn an M.S. in electrical engineering from MIT (1919) and the first woman professor of electrical engineering in the US (University of Texas at Austin 1947). Before teaching, Clarke worked much of her career as an engineer for General Electric. She invented the Clarke Calculator, a graphical device for solving power transmission line equations, and is also well known for authoring an influential textbook on power engineering. Dr. Colwell served as the first woman Director of the National Science Foundation (1998-2004), where she exemplified the importance of STEM education by her leadership in K-12 STEM education, graduate STEM education, and the increased participation of women and minorities in science and engineering. Colwell has also served in many leadership and advisory positions for scientific organizations and government agencies. Her award-winning scientific work is focused on water borne diseases of public health significance. For 18 years Dian Fossey studied, lived amongst, and befriended the gorillas of Rwanda. Fossey made many discoveries about gorillas including understanding gorilla vocalizations, gorilla group hierarchies and social relationships, and gorilla diet and recycling of nutrition. Her book, Gorillas in the Mist (1983) documented her intense study of these animals and the need to protect them from the constant threat of poachers and neglect. Susan A. Gerbi is the George Eggleston Professor of Biochemistry at Brown University, where her research team devised a method to map the start site of DNA replication at the nucleotide level. Her current research suggests that a steroid hormone receptor may play a direct role for regulating the initiation of DNA replication, with potential significance to understand the role of hormones in certain cancers. She also studies eukaryotic ribosomes, the cellular factories for protein synthesis. Helen Greiner is co-founder and former President/Chairman of iRobot Corporation, a world leader in consumer and military robots, and current CEO of CyPhyWorks. She is also a Trustee of the Massachusetts Institute of Technology (MIT) and the Boston Museum of Science (MOS), serves on the Robotics Advisory Board of Worcester Polytechnic Institute(WPI) and Army War College(AWC), and is a member of the Army Science Board (ASB). Grace Hopper was a pioneering computer scientist and Rear Admiral in the United States Navy. Hopper joined the Navy Reserve during World War II and worked as one of the first programmers of the Harvard Mark 1 Computer. She later wrote the first computer programming compiler (1952) and conceptualized the first modern programming language (1954). Upon her retirement she was awarded the Defense Distinguished Service Medal, the highest non-combat award given by the Department of Defense. Olga Linares is a senior staff scientist (emerita) at the Smithsonian Tropical Research Institute. Linares is best known for her work on the cultural ecology of Panama, concluding that Central America served not only as a corridor between Mesoamerica and South America but also as home to indigenous populations. Her current work centers on the social organization and rice cultivation technologies of the Jola peoples living in the Casamance region Southern Senegal. Julia Morgan was the first woman admitted to the architecture program at l'École nationale supérieure des Beaux-Arts in Paris, and the first woman architect licensed in California. Morgan designed over 700 buildings in California and is best known for her work on Hearst Castle in San Simeon. Many of her projects, including designing numerous YWCA buildings and facilities at Mills (women's) College, sought to advance opportunities for women. Louise Pearce was a physician and pathologist with the Rockefeller Institute. Pearce worked on the team that found a cure for African Sleeping Sickness (1919) and made a solo trip to the Belgian Congo to test the new drug (1920). From 1923 until her retirement in 1951 she researched susceptibility or resistance to infection with Dr. Wade Hampton Brown. Their discovery of a transplantable rabbit tumor was studied in cancer laboratories around the world. Jill Pipher is president of the Association of Women in Mathematics (2011), and director of the Institute for Computational and Experimental Research in Mathematics (2011). The ICERM is a NSF funded mathematics institute supporting cutting edge research on the intersections of mathematics and computers. Pipher is a professor of Mathematics at Brown University and has research interests in harmonic analysis, partial differential equations, and cryptography. Mary Ross was the first woman engineer at Lockheed's Missiles Systems Division (1952), and the first known Native American woman engineer. At Lockheed, Ross designed missiles and rockets, and developed systems for human space flight and interplanetary missions to Mars and Venus. After retiring, she began a second career as an advocate for women and Native Americans in engineering and mathematics. Susan Solomon is the Ellen Swallow Richards Professor of atmospheric chemistry and climate science at the Massachusetts Institute of Technology. Her groundbreaking research on chlorofluorocarbons (CFCs) as the cause of the Antarctic ozone hole was part of the basis of the international treaty that has effectively regulated damaging chemicals. She is also a leader in climate science, and is best known for seminal work showing that climate changes due to human increases in carbon dioxide will last for more than a thousand years. Flossie Wong-Staal is one of the world's foremost authorities in the field of virology. Wong-Staal was a pioneering researcher of retroviruses and with her team deciphered the structure of the HIV virus as the cause of AIDS. She was the first to clone and complete the genetic mapping of HIV making it possible to develop HIV tests. Wong-Staal continues her pioneering work in developing first-in-class therapeutics against Hepatitis C virus.